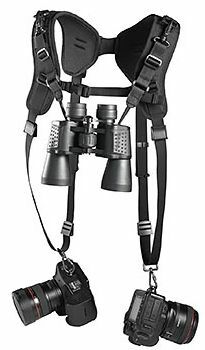 The binocular harness (or binocular suspenders as they are occasionally called) can be extremely useful, often preferable to just using the shoulder strap and in some situations are almost a definite necessity. In this guide to I will firstly go over some of the key benefits of using a bino harness and in which circumstances and uses where they are most useful. Then in the second part we will take a look and compare some of the different types there are decide which are the best for you, your needs and your budget. Then finally we will take look at some of the best along with my in-depth hands-on binocular harness reviews, which will hopefully make choosing and buying what is a relatively inexpensive accessory for your binoculars as easy as possible. 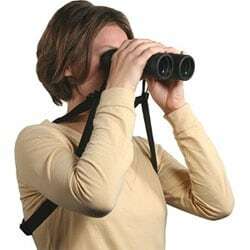 Why use a Binocular Harness? Firstly they make for a very secure way of carrying your binoculars, with no chance of you accidently dropping them. Also unlike a neck strap that leaves your binoculars to swing about, a harness keeps your expensive instrument close to your chest and out of harms way. A good harness for binoculars is also the most comfortable way to carry your instrument which just simply adds to the enjoyment of whatever it is that you are doing. The triangular shape that the harness makes between your optics, your face and where it attaches to your body, along with the elastic attachments that pull the binoculars slightly in towards your eyes makes for a very stable shake free view and certainly more so than without. If you are going to or often traverse difficult terrain. So I am thinking of hilly or mountainous areas with steep inclines or over large rocks and boulders for example. Here a harness is almost essential as not only does it free up both of your hands so that you can concentrate on not falling, but it also protects your binoculars from swinging about and potentially getting damaged on a rock or other hard surface as you climb over it. If you have a shake or use higher power binoculars, the anchor that they help form will help. 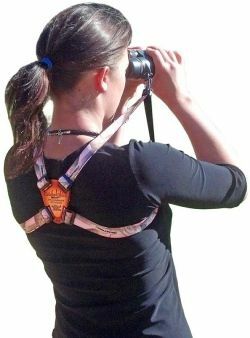 Not only are they comfortable, but if you also carry other gear like a spotting scope or your bird identification book, then a harness will certainly make your life a whole lot simpler. It is for good reason that hunters are primarily responsible for the increased usage and rapid development of innovations to harnesses for binoculars. This is because as a hunter you will most certainly be carrying about other gear that is often both large and heavy. So to have your optics kept safely out of the way, but easy and quick to get to is essential. The Best Binocular Harness for Hunting will also cover and protect your instrument. This also can add to the camouflage, but the cover will dampen down any sound should your rifle strike against it for example, which can be super important. Indeed there are even those that will not only carry your binos, but your rangefinder as well. For more on this, take a look at my guide to the Best Binocular and Rangefinder Harness. For the same reasons as hunters (see above) a harness can be an essential piece of kit for wildlife and nature photographers in particular. Initially harnesses were very simple, in that you basically had some elasticated suspender straps that you wore over your shoulders and around your waist and that attached to your binocular. This basic design still forms the core of a good harness today, but as with everything in life, nothing stays still and you now get a variety of styles, add-ons and designs that in some circumstances can work better for you depending on your objectives and needs. A new design, this has instantly become my overall favorite style of binocular harness. The sling style means that rather than having two straps over your shoulders, there is just a single one. Apart from making the harness smaller and less complicated, it is much easier to take on and off as all you have to do is slide your arm through the sling, rather than pulling it over your head as you do with the double suspender type of harness. 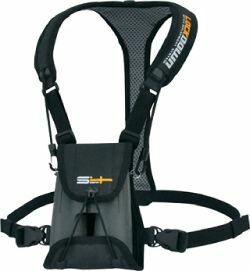 As far as I am aware, there is currently only one company making the unique, but excellent sling-style harness. 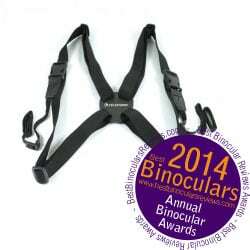 For more details check out my in-depth review of the Cotton Skout Binocular Harness. Costly: can be expensive compare to the simple strap. 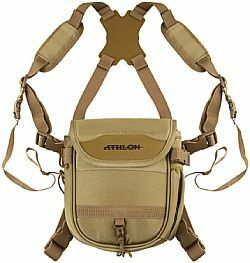 The very best bino harness in this category can cost well over $100. This is the multi-tool of harnesses. The cover binocular harness offers more protection than standard ones, but whilst it is not as much as the full case ones, they are more lightweight and less bulky and quite often cheaper too. If like me you often carry your camera, camera lenses, rangefinder, scope or other gear as well as a pair of binoculars with you, or indeed if you need to carry a combination of all of these, then you should consider a duel harness system that allows you to comfortably carry more than once piece of equipment with you. More details: Dual Harness Straps. Right from my first test with the Skout "Sling Style" Harness from Cotton Carrier, it immediately became my all time favorite bino harness. 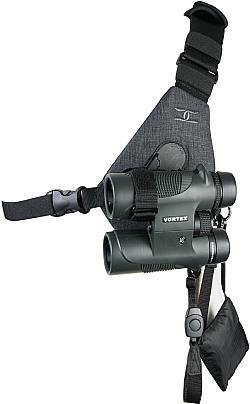 I tried it with mid-sized 32mm binoculars, full sized 42mm's, large 56mm and even a very large 70mm binocular and for me the only time you would not want to use it is if you need the extra protection that a full bag type of harness provides. Full review of the Cotton Carrier Skout Binocular Harness this contains a detailed guide that includes photos, video demonstrations, fitting instructions, my experience after using them and where to buy. My more in-depth guide to the Celestron version is actually in response to a question that I received from a reader who was looking for good but cheap bino suspenders. Simple and uncomplicated, it does what it is designed to do and does it very well. 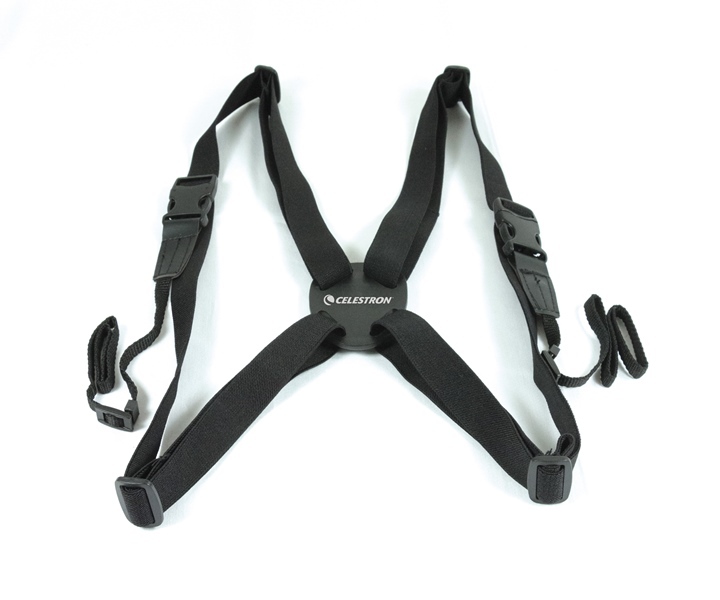 This binocular harness from Celestron is an inexpensive option for those looking to take the weight off their shoulders and free up both their hands when not glassing. 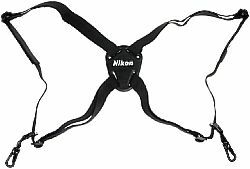 For more, please read my in-depth and hands-on review of the Celestron Binocular Harness Strap which includes photos, fitting instructions, my experience after using them and where to buy. Why? Well first and most importantly it secures your binoculars against your chest in such a way as they will definitely not swing around. As well as this, it fits very comfortably to your body and makes carrying even heavy binoculars for a long time no problem at all. They also make accessing your optics as well as returning them to your chest very quick. Another advantage of the LockDown system compared to most other binocular straps is that it has a pliable cover for a low profile fit that also protect your lenses, meaning you don't have also replace your lens caps every time you use them in the field as you do with a conventional harness. I was also very impressed with the overall quality of the product. For more, please read my full review of the LockDown Optics Deployment System that includes fitting instructions as well as all the advantages as well as disadvantages to using them. LockDown for binoculars from 6" to 7.5" in length. LockDown Micro for binoculars from 4.5" to 6" in length.